We offer an array of accessories to expand your system and protection for your home or business. Check out just a few of the additional accessories that can be added to your current or new system. Don’t forget to check out our Facts page! 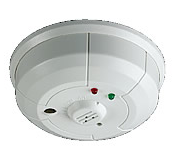 The powerful 5808LST is a combination wireless photoelectric smoke and heat detector that trips when temperatures reach 135º F. Ideal for difficult to wire locations, situations where room aesthetics are critical or where hazardous materials exist, the 5808LST provides the ultimate in installation flexibility. Remarkably cost-effective, the attractive, low profile unit blends easily with any décor and provides benefits rarely found in smoke detectors in this price range. Smart Check™ remote maintenance reporting automatically alerts the central station when it is in need of service, and built-in drift compensation continuously corrects sensitivity variances caused by dust. 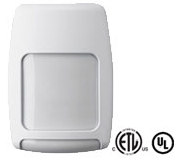 The 5808LST is UL 268 listed for use in both commercial and residential applications. 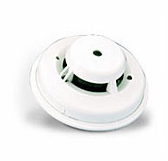 The 5800CO is a 3V battery powered wireless carbon monoxide (CO) detector intended for use with Honeywell alarm systems that support 5800 Series wireless devices. It provides early warning when its electrochemical sensing technology measures carbon monoxide levels in the air. 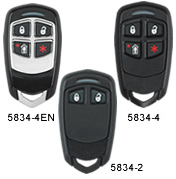 The 5800CO is specifically designed for system operation and is fully listed to UL 2075 as a system supervised detector. * It contains a piezoelectric horn which generates the ANSI S3.41 temporal 4 pattern in an alarm condition. The detector consists of an electrochemical carbon monoxide sensor assembly coupled with a wireless transmitter. The transmitter can send alarm, trouble, end-of-life, tamper and low battery condition messages to the alarm panel.Since there are no holes to drill or wires to run, you can preserve the beauty of the home or building while protecting its occupants from harmful carbon monoxide gas. The 5800CO is an ideal carbon monoxide detector for difficult to wire locations, applications where room aesthetics are critical or where hazardous materials exist. Electrochemical detectors are the newest, most refined CO detectors available and provide the most accurate measurement of CO concentration obtainable. They can take readings from low levels that may be hazardous over long periods of time to high concentrations that present an immediate danger. A built-in piezoelectric horn generates the ANSI S3.41 temporal 4 pattern in an alarm condition. The local sounder will also alert the end-user of other conditions such as low battery, detector trouble and end-of-life. Dual LEDs provide local visual indication of the detector’s status–including normal operation, alarm, low battery, trouble and end-of-life. When the detector has reached the end of its life, the detector will send a trouble signal to the panel. This indicates that the CO sensor inside the detector has passed the end of its life and the detector needs to be replaced. The detector’s lifespan is approximately six years from the date of manufacture. The 5800CO is fully supervised to monitor for low battery, case tamper and trouble conditions. This dual-purpose button allows the end-user to perform periodic testing of the detector. In the event of a CO alarm, this button will silence the local sounder alarm for a five minute period. Note: the Hush feature will not operate at levels above 350 ppm (parts per million) carbon monoxide. Whether you choose to affix the detector to the ceiling or a wall, mounting is made simple with the enclosed hardware. The mounting base has large mounting ports, which accommodate drywall anchors for easy surface mounting. The detector has a built-in tamper switch that can communicate back to the control panel in the event it is removed from the base. For an added level of security, the detector also includes a tamper resistant element that prevents removal from the base without the use of a tool.